Doesn’t Chuck Hagel look like the dad from The Graduate? Graham chose to spend his Sunday talk show dollar on CNN’s “State of Union” with Candy Crowley, taking great pains to express his displeasure with President Obama’s likely nomination of Chuck Hagel for Secretary of Defense. The senior senator from South Carolina described Obama’s pick of Hagel as being, “controversial”, painting him as some sort of fringe candidate whose views are well outside the range of mainstream America. Graham spent much of his time focusing on what he termed Hagel’s history of being, “antagonistic towards the state of Israel,” without providing much in the way of concrete examples of said antagonism. Outside of encouraging dialogue between Israel and Hamas, the terrorist/rebel group that controls Gaza, Graham provided nothing substantive in support of his accusations against Hagel, instead choosing to repeatedly paint Hagel as the most anti-Israel Secretary of Defense candidate in US history. Even if you can look past the absurdity of a GOP senator criticizing the victorious Democratic President’s choice for his own cabinet, Graham’s hysterics are unwarranted and bizarre. Chuck Hagel was one of the most popular senators in recent memory, at least in his home state of Nebraska, taking in almost 83% of vote in his 2002 run for re-election, the largest margin in state history. 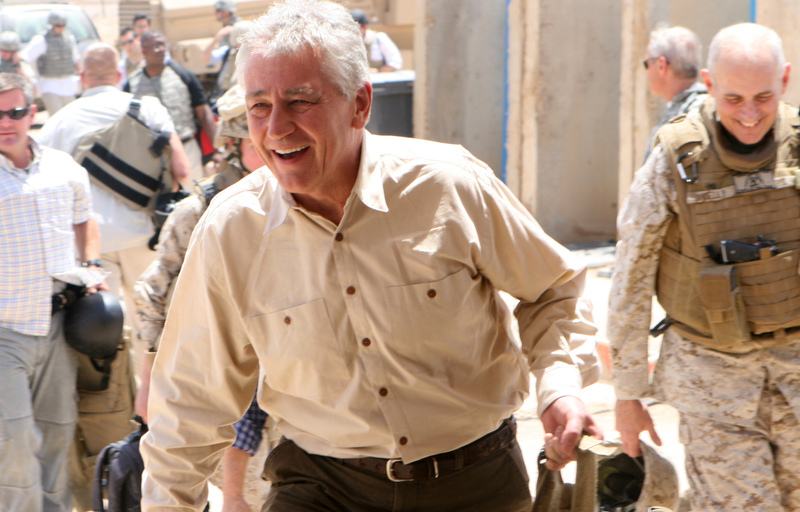 Hagel is a veteran of the Vietnam War, where he was a squad leader for the 9th infantry division and earned two Purple Hearts. His repeated criticism of the Iraqi troop surge and the Bush Administration’s foreign policy decisions in general may have labeled him as a Republican In Name Only (RINO), but a RINO is a hell of a lot better for the GOP than a card carrying member of the ACLU. If Graham and his fanatically pro-Israel Republican colleagues in Congress won’t vote for Hagel, it begs the question as to who they would approve of. As far as I know, Donald Rumsfeld and Paul Wolfowitz ain’t riding back into town on any white horse, so what could the GOP possibly be hoping for? It seems as if a good deal of the hemming and hawing from the right has less to do with any of Hagel’s indiscretions and more to do with contrarian bitching being the modus operendi for the GOP in 2013. Before this election, it was a rarity that opposition leaders openly criticized and threatened to block the appointment of presidential cabinet positions. Now, President Obama is getting hammered for decisions on cabinet appointees before he’s even made them. During his interview, Sen. Graham made a point of bringing up his support of Obama’s nomination of John Kerry for secretary of state during his second term, stressing that, while he and the former Massachusetts senator were on opposite sides of the political spectrum, he had the utmost respect for him and his abilities as a statesman. Of course, what remained unmentioned, but glaringly evident, is that Kerry had only received the nomination after a protracted battle between Obama and the GOP over his rumored first nominee, UN Ambassador Susan Rice. Kerry’s appointment came as a direct result of folks like Graham and Senators John McCain (AZ-R) & Kelly Ayotte (NH-R) hounding Ambassador Rice over her involvement in the attack on Benghazi, which ultimately amounted to repeating White House talking points on the Sunday talk shows. It stands to reason that Graham would be pleased as punch with the man he essentially strongarmed into Obama’s cabinet. For the record, I am not a fan of Chuck Hagel. His record on civil liberties is abysmal, he supported the Iraq war and he’s quite the homophobe. In the late 90s he opposed President Clinton’s nomination for the ambassadorship to Luxembourg because, among other reasons, he thought that nominee James Hormel was, “openly, aggressively gay.” I don’t quite know what Hagel means by “aggressively gay,” but judging on his long anti-LGBT voting record in the senate, I’d imagine it’s none too flattering. Personally, I would love to see Obama nominate Michele Flournoy, a seasoned policy expert with a Harvard pedigree and experience as Obama’s Under Secretary of Defense for Policy until last year. Not only would you get a staunchly Democratic Defense Secretary, but you would be appointing the first female Secretary of Defense in US history, offsetting the loss of Hillary in the State Department and sending a clear message that the military is not just a man’s world. At the end of the day though, this is all about Israel and the fanatical devotion to the state by conservative America. Even though five former US Ambassadors to Israel wrote letters of recommendation for Hagel’s nomination, the GOP has honed in on some comments he made in 2008 about the “Jewish Lobby” intimidating a lot of the policymakers on Washington. Granted, his use of the term Jewish instead of Pro-Israel was unfortunate (and perhaps Freudian), but that comment is not enough to warrant an all out attack on a man’s character. Frankly, Hagel was right on the money about the influence that Pro-Israel organizations and interests have on our foreign policy decisions. You only have to go back to the Democratic National Convention when the Democrats tried to sneak a mention about being a friend to Israel back into their party platform after the punditocracy exploded in a fit of unbridled rage at such an omission. It’s gotten so bad that a failure to explicit state our support for Israel is now being interpreted as open hostility. Compare this to the rest of the globe, who has a predominantly negative opinion of Israel and just overwhelming voted to acknowledge Palestinian statehood and the last thing we need is another Secretary of Defense whose mouth is permanently affixed to Israel’s teet. There’s a lot about Chuck Hagel that I don’t like, but none of it has do with any of the drivel that’s coming from Lindsey Graham.